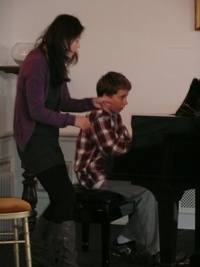 Cellist Adrian Brendel and pianist Min-Yung Kim were visiting the island courtesy of the Sundeep Watts Memorial Fund, and were resident at the academy for their visit. A group of students and staff from the academy attended their concert at the Jersey Arts Centre on Saturday 6th November, which presented four contrasting sonatas for cello and piano – Zemlinsky, Beethoven no.2, Debussy and Brahms no.1. This event was very well attended and clearly this wonderful duo had the audience spellbound, leading to an encore of Bartok’s Romanian Folk Dances. 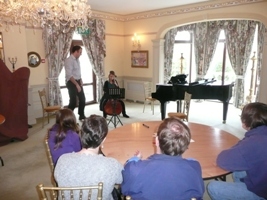 The following morning the duo gave separate cello and piano masterclasses to a group of local young musicians who had enjoyed the previous evening’s concert. We would like to thank the Sundeep Watts Memorial Fund for offering the academy the opportunity to host these fantastic musicians, and for the inspiration they were able to pass on.